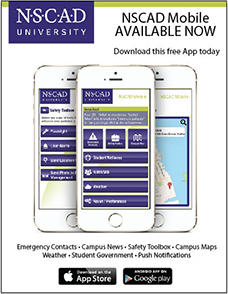 NSCAD is responsible for protecting and promoting the health and safety of the university community, and takes every precaution, reasonable in the circumstances, to ensure that the university environment is safe and healthy for faculty, staff, students, and the general public. All students registered for credit and non-credit courses, sessions and workshops at the university have the right to be provided with appropriate Health and Safety information (including the NSCAD Occupational Health and Safety Policy), and any specific safety instruction, training and/or personal protective clothing or equipment required to prevent or minimize risks they may be exposed to in their particular area of study. All students are responsible for complying with the Health and Safety regulations and policies of NSCAD and the community. Please review the full Health and Safety Policy. If you have not yet gotten yourself a family physician in Halifax, you can refer to the Nova Scotia Government’s updated list of doctors who are accepting new patients (www.gov.ns.ca/health/physicians), or visit Saint Mary’s University Health Services. Click here for more information on Health Services for NSCAD Students. Always ensure that your valuables are adequately protected and remember this if you have to leave your work studio, classroom or study space unattended, even for a few minutes. Always ensure that the area or work is properly secured in your locker or secure studio area, and that your property is protected. Never leave doors propped open even for a short period of time. More than 80 percent of thefts occur when property is left unattended in an open area. Items such as backpacks, purses, laptops, phones and cameras should never be left unattended. The University is not responsible for theft or loss of personal or borrowed items. Please also note the importance of using the buddy system when working on campus outside of class time. In addition, immediately report any suspicious person(s) to Security. Card access was designed to accommodate those students which require after hours access to their studio space or after hours access to the university for academic requirements. The Port Campus presently has card access technology at the following points: Front Entrance / Wood Shop / Metal Shop / Foundry / Computer lab and electronic / media equipment storage room. The Port Campus entrance is open to everyone and has security at the front entrance during the following times: Monday to Friday 7 am to 11 pm. // Weekends 7 am to 5 pm. The shop areas (metal / wood and foundry) are controlled by the technicians and basic function / access has not been altered due to the installation of card access. The computer lab and equipment storage room are managed by Donnie Thompson and multi-media department. Access to specific areas is identified on the card access application form and must be signed off by those responsible for that area. Card Access application forms are available from the shop technicians, the foundation office or the main Security desk at the Port. Once the application is completed with all required signatures / authorizations, forms are to be returned to the Port Security Desk or Facilities Management and will be processed as soon as possible. The application form has specific areas for signatures; please ensure that the application is signed by those responsible for individual areas. Access cards will be available for pickup at the security desk within 72 hours. Please ensure you have your NSCAD I.D. when picking up your card.